House Democratic Leader Rep. Nancy Pelosi (D., Calif.) said on Thursday that using terms such as "illegal aliens" wasn't "viewed as constructive." Pelosi was holding a press conference at the Capitol where she was asked about whether allowing illegal aliens to work in the United States was hurting Americans' wages. "That's not the point. 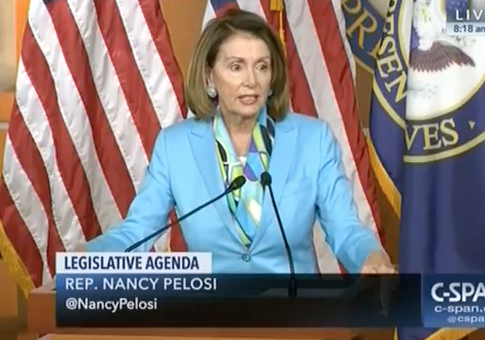 Using terminology like ‘illegal aliens illegally entering the country' is just not viewed as constructive," Pelosi said. Pelosi added that there is a responsibility to protect the nation's borders and to protect America's values. She said the issue at hand was about those seeking asylum and not those entering the United States illegally. This is not the first time someone has said it is "offensive" to call a person who enters the United States illegally an illegal immigrant or illegal alien. MSNBC host Andrea Mitchell said last fall it was offensive when Attorney General Jeff Sessions used the term illegal alien during a press conference. "To say nothing of the use of his word ‘illegal aliens,’ which is offensive to a lot of people and not correct," Mitchell said. Many, especially those on the left, prefer the term "undocumented migrant" to describe those who illegally cross into the United States. The Asian American Journalists Association has also encouraged people not to use the term "illegal" in any way to describe such individuals.